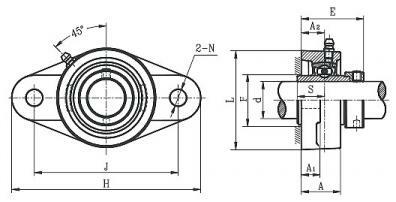 HCFL212-38 mounted bearing. The inner diameter is 2 3/8". D H J L A2 A1 A E N S F min. 2 3/8" 9 27/32" 7 31/32" 140" 1 11/32" 27/32" 27/32" 3 3/16" 23/32" 1 7/32" 3 1/32"